Posh midfielder Louis Reed could start at Charlton. 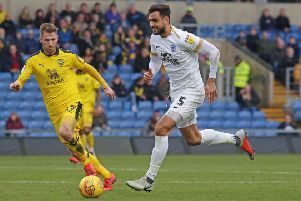 Peterborough United manager Steve Evans is expected to break up the side that has won the first three League One matches for the tough trip to Charlton tomorrow (August 21, 7.45pm). Posh have fielded the same starting line-up in wins over Bristol Rovers, Rochdale and Luton Town. They’ve scored nine goals in those games and soared to the top of the League One table. Ivan Toney (left) is in the running for a Posh starting place at Luton. But Evans believes there is a need to freshen up the side with striker Ivan Toney and midfielder Louis Reed in the running to claim a starting place. Posh also travel to Plymouth on Saturday (August 25). “There were times against Luton on Saturday when we were outstanding,” Evans stated. “And times when we weren’t so good. We will probably need a 90-minute performance at Charlton so maybe we need to freshen things up. “We are putting so much energy into matches it’s inevitable some players will start feeling tired so I might make changes tomorrow. “There are players who have not played yet who are pushing hard for a start. Ivan Toney made a big impact for us in the last 20 minutes against Luton. He held the ball up well and we got on the front foot a bit more. He’s such a big presence opponents worry about him. “And if I was picking players based on training performances Louis Reed would have started every game. He has been phenomenal. He’s a bit different to our other midfielders as he’s more technical and he has the ability to pass the ball wherever he wants. “I’ll make my mind up after training today (Monday) when I’ve seen how sharp everyone is after Saturday’s tough game. “We will need to be better for longer tomorrow as Charlton are a top League One club. They belong in the Championship and once they sort themselves out behind the scenes I’m sure that’s where they well end up. Matt Godden and three-goal Mark O’Hara could be the players to step down if changes are made. Marcus Maddison is again likely to start on the substitutes’ bench alongside goalkeeping coach Mark Tyler who is needed to fulfil a Football League requirement of one ‘home-developed’ player in a matchday squad.